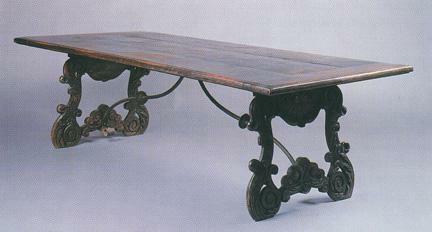 The table, item 129 in the Baker Collection, is described in the Sotheby's Catalog as, "A massive Baroque Revival carved hardwood and wrought-iron trestle table has a rectangular planked top with molded edge raised on pierce-carved foliate supports joined by a wrought-iron stretcher. Height, 29 inches; length, 8 feet 2 1/2 inches; width 42 inches. Price $7,000-9,000." From Images of Baker Furniture Collection, Sotheby's Sale: Centuries of Style: Furniture, Decorations and Fine Art, Chicago, October 18 & 19, 1999.